Stir together the wine, miso, and sugar in a small saucepan. Bring to a boil over medium heat and cook for 3 minutes. Reduce to barely simmering. Brush the cut sides of the eggplants with the sesame oil. Put the eggplants cut-side down on a baking sheet and place under the broiler of your oven for about 5 minutes, checking often to make sure that they do not burn. Turn them over, and cook for another 5 minutes or until the tops are a light to medium brown. Reduce the oven to 375F and continue to cook until soft, 10-15 minutes. When the eggplants are tender, top each one with the miso sauce and put them back under the broiler until the sauce bubbles up, roughly one minute. Serve hot, sprinkled with toasted sesame seeds and green onions. 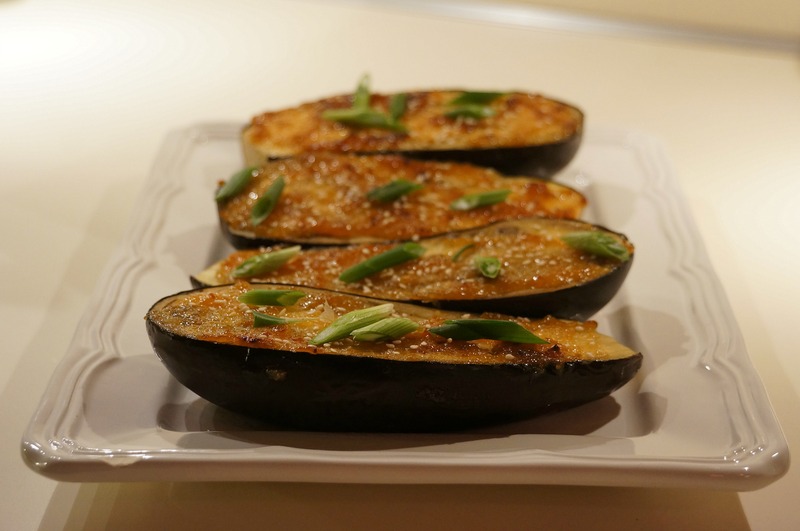 This entry was posted in Side Dishes and tagged eggplant, miso, sesame. Bookmark the permalink.